Conference Centre at Osea Island Resort02073 846403work Conference CentreEscaping to this rare and romantic gem with a breath-taking coastline. Privacy is guaranteed in this un-spoilt marine sanctuary, with its abundant variety of wildlife and rare birds. A range of accommodation is on offer, from the charming Manor House, a grand Edwardian seaside residence, sleeping up to 20 to a small hamlet of 10 beautifully appointed period cottages offering rustic chic. All accommodation which is set 20ft above sea level is available to let on a weekly, weekend and short break basis. The island provides a variety of special interest packages such as cooking and the creative arts; music, writing, drawing and painting. For those who want a little more luxury and pampering your stay can include a personal chef, a daily housekeeping service, massage, beauty treatments, and babysitting. Leave your vehicle behind and enjoy walking or cycling everywhere while exploring the island with its fishing, sailing, bird watching and nature walks. Escaping to this rare and romantic gem with a breath-taking coastline. -Turn left onto A10 Kingsland Road. -Turn right onto A104 (signposted Dalston, Hackney). -Keep in left hand lane then at traffic signals turn left (no signs). -At mini roundabout bear right onto Dalston Lane A104. -At traffic signals turn right onto the A107. -At Redbridge roundabout take the 3rd exit onto Eastern Avenue A12 (signposted M25, Chelmsford). -At Junction 20A branch left, then merge onto Bury Lane - B1137 (signposted Hatfield Peverel). -At Duke of Wellington Pub turn right onto Maldon Road - B1019 (signposted Maldon). -At Elms Farm Roundabout take the 1stexit onto Langford Road (signposted Heybridge). -Turn right onto Holloway Road. -At roundabout take 1st exit onto Heybridge Street - B1022 (signposted Great Totham). -At roundabout take 2nd exit onto Goldhanger Road - B1206 (signposted Tolleshunt D'Arcy). 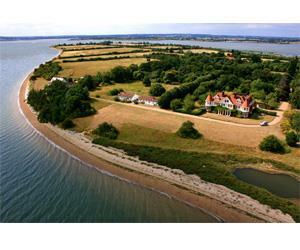 -Turn right onto Osea Island ( look out for Osea Island leisure sign). Total Time: 1hour 55 minutes.